I know sad. Well originally the special edition of the game was supposed to just come with a 12 inch Batarang to defend yourself against all the crazy different Batmen in your secret underground subway layer. Well not any more!!! Hit the jump to see the complete special edition pictures with details for this game and let me tell ya it is a doozy!!! 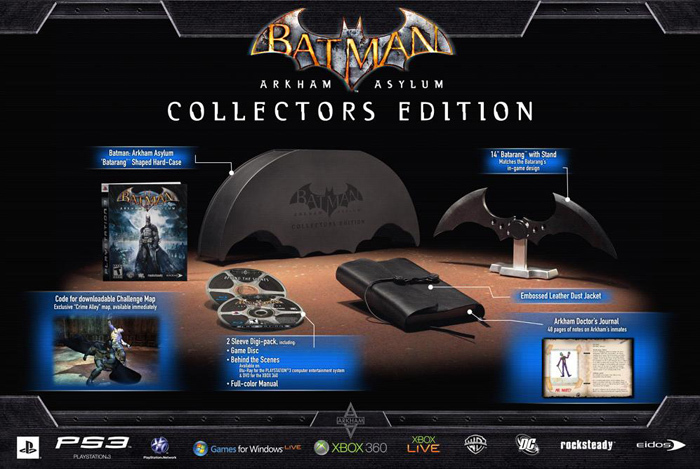 It now appears to come with a 14 inch Batarang with a display stand , A Code for some cool extra DLC, A hard shell case, A 48 page leather bound journal on all of Arkhams inmates, A behind the scenes extra disk on the making of the game, and the Bat suit. Ok not the Bat suit but it would be AMAZING if it did right. As of right now you can pre order this bad boy for the price of $99.99 on Amazon.com which is a little bit more expensive then the normal $52.99 you would normally pay for a game but ummmm normal games don’t come with this much awesome!!! I know when Simon see’s this he will start working on a Batsuit and a utility belt…ughh then LA will need a better class of criminal. We will try to keep you posted on more info on this GREAT LOOKING GAME!! !